Clear all the jellies(72) and reach 75000 points to complete the level. This level have a two board and little bit if you combine both with 72 candies and all are jellies and you need to complete in just 30 moves. You will get free fish and color bomb booster that you can select in start of level. 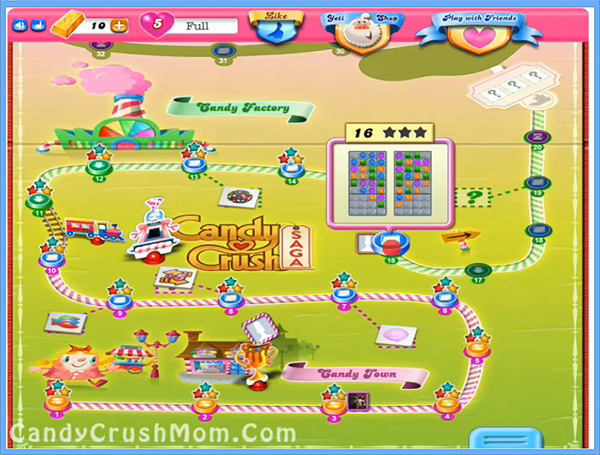 You have to be little bit tricky and you need to make strategy that can help you in making special candies like wrapped candy instead of just playing and combining 3 normal candies. Some tricks like if you combine wrapped with striped candy that will clear 3 row and columns instantly plus you could get after automatically some special bombs or bonus will break some more jellies with big score and help to complete level before all moves. You will have fish booster in end and will eat candies randomly that you can also see in a walkthrough video. We completed this 72 candy board just in 15 moves and it give fist booster in end that eat some random candies and in end give big 427020 points. We try to focus more on special candy and colorbomb to break more jellies in less moves plus these special moves help to ear much sweet points.